The monster sunspot group AR 1476 (upper left) measures more than 60,000 miles from end to end. NASA's Solar Dynamics Observatory spacecraft snapped this photo on May 7, 2012. The huge sunspot complex, known as AR 1476, rotated into Earth's view over the weekend. It measures more than 60,000 miles (100,000 kilometers) across, researchers said. Scientists with NASA's Solar Dynamics Observatory mission, a space-based telescope watching the sun, dubbed the solar structure a "monster sunspot" in a Twitter announcement. "With at least four dark cores larger than Earth, AR 1476 sprawls more than 100,000 km from end to end, and makes an easy target for backyard solar telescopes," the website Spaceweather.com reported Monday (May 7). Sunspots are temporary dark patches on the surface of the sun that are caused by intense magnetic activity. These structures sometimes erupt into solar flares, which send high-energy radiation streaming into space. Solar physicists classify flares into three main categories: C, M and X, with C being the least powerful and X the strongest. X-class flares can cause long-lasting radiation storms in Earth's upper atmosphere and trigger radio blackouts. M-class flares can cause brief radio blackouts in the polar regions and occasional minor radiation storms, while C flares have few noticeable consequences. AR 1476 has already proven quite active, firing off a number of C flares over the past few days. And another sunspot group, AR 1471, erupted Monday evening with one that seems to be an M1, one of the least powerful M flares, according to Spaceweather.com. Big solar flares are often associated with coronal mass ejections (CMEs), massive clouds of solar plasma that streak through space at 3 million mph (5 million kph) or more. If these clouds hit Earth, they can wreak havoc, spawning geomagnetic storms that can disrupt GPS signals, radio communications and power grids. CMEs also often super-charge the northern and southern lights, providing dazzling shows for skywatchers at high latitudes. Monday evening's eruption from AR 1471 apparently generated an Earth-directed CME, which should hit Earth sometime Wednesday morning (May 9) Eastern time, researchers said. The monster sunspot AR1476 (top left) turns into view in this image from NASA's Solar Dynamics Observatory released on May 7, 2012. After remaining surprisingly quiet from 2005 through 2010, our star began waking up last year, spouting off numerous powerful flares and CMEs. Most experts expect such outbursts to continue over the next year or so. 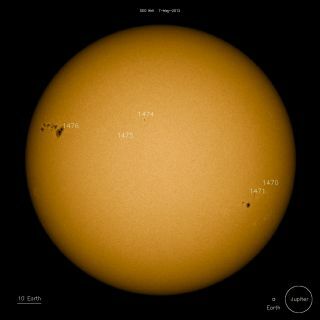 Solar activity waxes and wanes on an 11-year cycle, and scientists think the current one — known as Solar Cycle 24 — will peak in 2013.